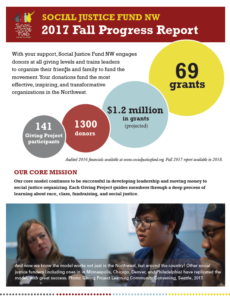 With your support, Social Justice Fund NW engages donors at all giving levels and trains leaders to organize their friends and family to fund the movement. Your donations fund the most effective, inspiring, and transformative organizations in the Northwest. Read previous financial reports from 2011-2014.